A team of Hofstra Law students (front row, left to right, in photo) Meagan Callahan 3L, Allie Stapleton 3L, Elida “Elle” Alfaro 3L and Jaclyn Ruggirello 2L won the New York Regional of the American Association for Justice (AAJ) Student Trial Advocacy Competition (STAC), one of the most competitive and prestigious national mock trial competitions. The event was held in New York City on March 1-4. 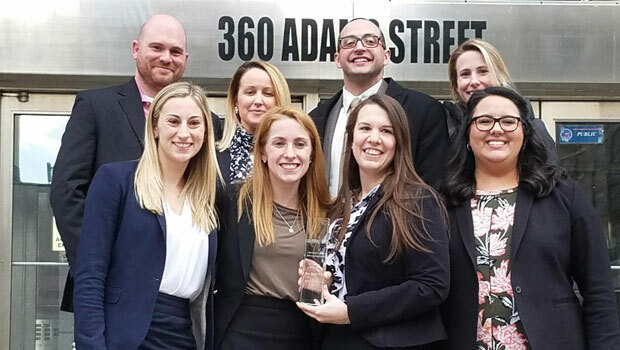 The Hofstra Law team defeated 15 teams from Brooklyn Law School, Fordham University School of Law, New York Law School, NYU School of Law, Pace University Haub School of Law, Seton Hall University School of Law, St. John’s University School of Law, Touro College Law Center, and Yale Law School. The team was coached by (back row, left to right) Courtney Charles, Andrea Mauro, Alexi Poulianos ’11 and Lauren Reilly ’16. AAJ’s mock trial cases are always civil cases and tend to deal with products liability, personal injury, or medical malpractice/negligence issues. Teams are judged on their skills in case preparation, opening statements, use of facts, the examination of lay and expert witnesses, and closing arguments. There is no written exercise. Along with the 13 other regional champions, the team advances to the National Finals Competition, in Raleigh, North Carolina, on April 12-15. 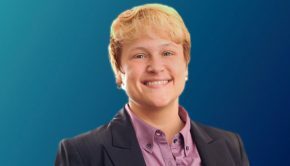 The victory also results in Hofstra Law receiving one point from the National Board of Trial Advocacy toward a chance to be selected to compete in the Tournament of Champions Trial Competition. AAJ seeks to inspire excellence in trial advocacy through training and education for both law students and practicing attorneys. The association accomplishes this goal in part by sponsoring the Student Trial Advocacy Competition, an annual nationwide mock trial competition. The competition is an exceptional opportunity for law students to develop and practice their trial advocacy skills before distinguished members of the bar and bench.